I am, and I'm particularly loving creating lots of variety with the Heartfelt Blooms stamp set. Over the next couple of weeks I'll be showing you a variety of ways to use this set and today we are starting simple with the Stamping Off Technique. This is the image I'm using. 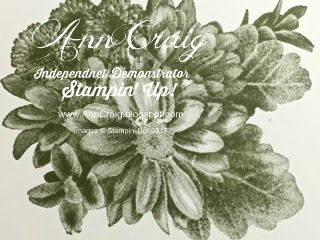 It is one of the new Distinktive stamp range from Stampin' Up! - very detailed and absolutely gorgeous. Isn't it stunning? I've used Always Artichoke ink for this image. The technique I used for the card is "Stamping Off" - an easy technique that only requires you to stamp the image on a piece of scrap paper before stamping onto your card front - thus giving you a lighter tone of the colour you are using. I have stamped the entire card base using the Stamping Off technique and then stamped a strip of card stock in full strength ink. This creates a lovely soft background for your focal point. The completed card. I stamped onto Very Vanilla card stock and matted that onto a Very Vanilla Thick card stock base. 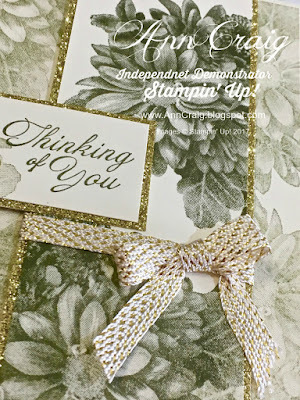 Some Gold Glimmer paper was used along with some retired gold and vanilla Stampin' Up! ribbon. Linen Thread would look lovely if you don't have suitable ribbon. This card is very quick to make and looks great in so many of the Stampin' Up! Classic Ink colours. Give it a try! If you'd like to own the Heartfelt Blooms stamp set you will need to qualify for it via the Sale-A-Bration promotion. You cannot buy it, as it is only available via Sal-A-Bration. It's quite simple really - all you need to do is place an order for at least $90 (Australian residents only) then add the code for Heartfelt Blooms in at the end of the order. You will get this lovely set for FREE. Sale-A-Bration is a wonderful time to start your journey with Stampin' Up! as there are lots of additional benefits for joining during this promotion. If you live in Australia you can get our amazing Starter Kit where you choose items to the value of $235 from any current items. This includes the Annual Catalogue, the Occasions catalogue and the Clearance Rack. During Sale-A-Bration you choose an extra 2 stamp sets to any value, and pay just $169. As an added bonus there is FREE SHIPPING on your Starter Kit. If you have a large order - this is a great opportunity for you. Contact me if you would like further information. There is so much to offer during Sale-A-Bration, and when you combine the free products with items from the Occasions Catalogue, you have unlimited options for creativity. See below for items you need to create this card.Simply by purchasing these products you will be able to get the stamp set for free.